In wok, heat 1 tablespoon of vegetable oil over a medium-high heat. Add the vegetables starting with the tough ingredients cook these for 2 of minutes until slightly soft. Add the rest of the vegetables and cook for an extra 2 minutes. Add the marinate ingredients and mix well. Once the vegetable mix is cooked, put it on a plate and let it cool. Fold over diagonally and stick together, holding your finger tips over the ‘roll’ and using your thumbs to roll the pastry slightly to enclose the filling. Fold the sides and stick them together with the egg Roll up the pastry and stick the seam together with the banana to close. Half-fill a large pot, wok or deep-fryer with vegetable oil and heat to 170°C (350°F), or until the tip of a wooden chopstick or skewer starts to fizz after 2–3 seconds in the oil. 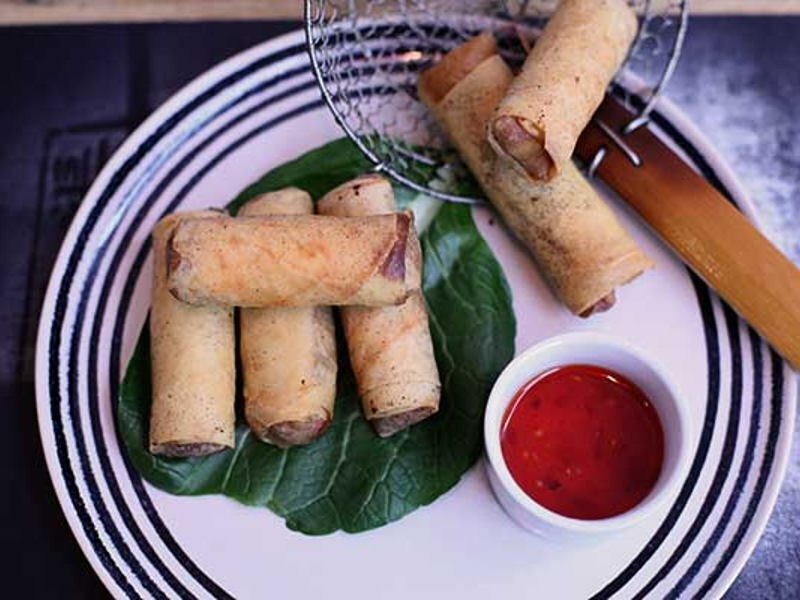 Carefully add the spring rolls in batches of no more than 10 at a time and deep-fry for 4 minutes, until golden brown. Remove the spring rolls carefully with a slotted spoon and drain well on a plate covered with kitchen paper.